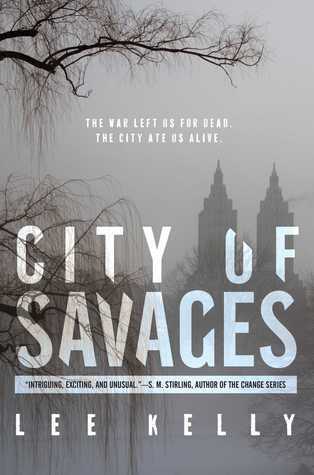 My last Big Book of the Summer for my annual reading challenge was City of Savages, a YA post-apocalyptic novel (with a touch of dystopia) by Lee Kelly. Though it was a bit uneven at times, overall I found the novel very compelling, as evidenced by the fact that I stayed up much too late every night while I was reading it! Sisters Skyler (Sky) and Phoenix (Phee) have grown up in a Manhattan transformed by a terrible war that started when Sky was a baby. The only world they've ever known is one in which they, along with their mother, are prisoners of war in a camp in Central Park overseen by the Red Army and directly run by a fellow POW named Rolladin. Tough but generally fair, Rolladin rules the new citizens of the park, as they grow crops, hunt, and try to maintain some semblance of a society. Sky, Phee, and their mom live on their own in an abandoned building on Wall Street during the summer but return to the park each fall for the required annual prisoner census and live with the others in an apartment in the Carlyle during the winter. Rolladin and her female warlords - whom the sisters refer to among themselves as whorelords - maintain the peace and keep order, sometimes with violent means. Life has always been this way for Sky and Phee, but this fall, some strangers arrive in the park with stories that contradict everything they've ever known about the world. About the same time, Sky finds an old diary of her mom's that finally tells them all the things they've ever wanted to know about the start of the war and their own past. This captivating novel combines a post-apocalyptic world ruined by war with a fledgling dystopian society and plenty of suspense. Family drama and a dose of romance are also rolled into the story. As I said, I found the story very engaging and often forced my eyes to stay open at night for "just one more chapter." The chapters alternate between the sisters' perspectives, and although they are very close - having never been apart from each other - they are also very different, so their different points of view add complexity to the story. Excerpts from their mom's diary are included in the text so that the reader learns how all this started alongside Phee and Sky. Although I guessed one big twist in the plot about 150 pages before it was revealed, there were plenty of other unexpected developments that took me by surprise (though some were admittedly a little strange). Overall, it's a unique and absorbing story that easily kept my attention right through to the satisfying conclusion. A good end to a very good Big Book Summer. Listen to a sample of the audiobook. I didn't listen on audio (other than this sample), but it sounds like it would be good, with four different narrators. Or order City of Savages from Book Depository, with free shipping worldwide. I've just started to see this book on blogs and it's getting pretty good reviews.